When you call 3dCart and get transferred to 3dCart Support, you’ll find that they do basic troubleshooting and problem-solving. 3dCart Support staff are such a helpful resource for 3dCart e-commerce store owners that their support is a big reason why we recommend 3dCart to our clients. The staff in 3dCart’s Support department is there to answer your questions 24 hours a day, 7 days a week. However, with thousands of customers asking questions every day, it can take a while for them to get to your call or reply back to you through the store admin panel chat window. That’s why we’re listing six ways to make it easier for you to find and get 3dCart Support help when you need it, other than calling Support line, which you probably already know about. 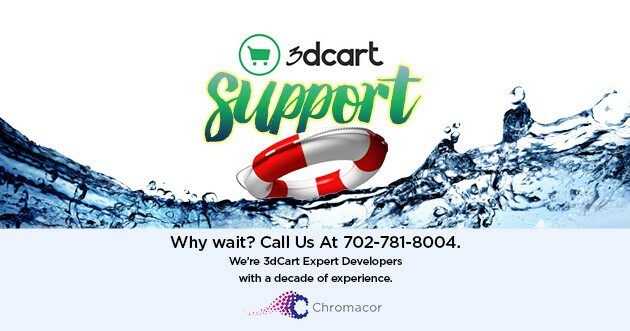 Of course, when you have an urgent request, you can get 3dCart Support help right now from Chromacor at 702-781-8004 – we’re 3dCart Expert Design and Development Partners with a decade of expertise on their platform. Well, what if you can’t get through, or they’re busy? In our experience, when calling the Support phone number at 1-800-828-6650 x 3, we have waited on hold for up to an hour. After they introduced their automated call-back system, it takes about 1-2 hours to get a return phone call during the work week and about a half-hour on the weekend. Email replies from tickets opened via the store admin usually take 24 hours to get a reply. If you log into your 3dCart store admin to send a request through their chat window, you may get a reply in a couple of days. The response times from 3dCart’s Support team are reasonable for most requests but sometimes you need immediate answers when you have more urgent needs. What happens if you have more than a basic question, especially if it involves coding or more advanced design? You usually get referred to Sales for a custom programming quote, and then the question turns into a project that can take a few weeks to get done. These are useful resources that you may not already know about to help you find immediate answers for your 3dCart questions or problems. A knowledgebase is an online resource for finding answers to questions about a specific product or software application like 3dCart shopping software. In the past year and a half, 3dCart has made more of an effort to keep their knowledgebase updated with current posts for their upgraded system and has written more articles to answer questions about new features and updates that they’ve made to their system. You can also get answers about how to integrate third-party software and apps. Sometimes other people have had the same problem you’re having right now and 3dCart has already written a blog post to address it in the 3dCart Blog. The 3dCart Forum is an informal shot-in-the-dark way to research and find answers. It will take longer for you to get the 3dCart “how to” answer you were looking for if you search in the forum to dig through individual forum entries to find what you’re looking for. The forum is for merchants to discuss their stores and ask questions of each other, so you may or may not find the answers you’re looking for. If you register with the Forum, you’ll be able to post your question there to see if you get answers from other 3dCart store owners. 3dCart how-to videos and tutorials can be found on their YouTube channel where they cover a wide range of topics. You’ll find topics like “how to set up your 3dCart store,” “how to set up payment methods,” answers to questions about products and product options, shipping and integrating apps. They also post webinar recordings so that you can watch them when it’s convenient for you. Over the past ten years, we have created our own online system for finding answers to 3dCart how-to questions. We’re launching our own Knowlegebase where you will be able to find even more 3dCart tutorials and answers to address specific 3dCart problems that you may be having. For urgent 3dCart Support now, the answer’s simple: call Chromacor at 702-781-8004. We have resolved issues immediately for 3dCart store owners who need phone contact and extra help. Why call Chromacor to solve your 3dCart Support issues? We’re 3dCart Expert Design and Development partners with a decade of expertise. We know their system inside and out. Often we can give you the answers that you can’t get from their basic support staff. Of course, you could just wait on hold. And wait, and wait. When you get through to 3dCart Support don’t be surprised if they tell you they won’t fix your problem or advise you because you have had a feature or web component customized by someone other than 3dCart. You will get referred to their Custom Programming Salesperson who will give you a quote and a not-right-now completion date, usually two or three weeks away. Not the answer you were going for when you originally called, right? How much time did that cost you? We’ll save you all of that time and get you going right now. We’re 3dCart Expert Development and Design Partners with a decade of expertise on the 3dCart e-commerce platform. When you call us, we’ll fix your 3dCart problem right now, not one to two weeks from now! Looking for help at night or during weekends or holidays? Send a request below, we’ll call right away!